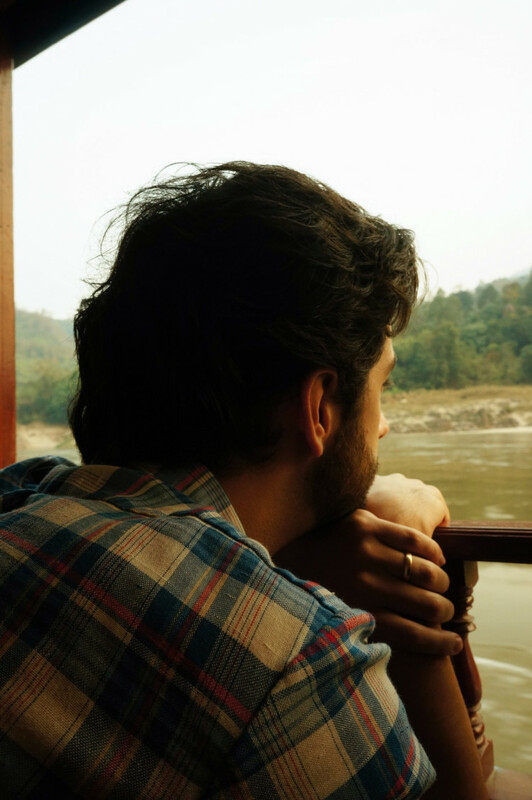 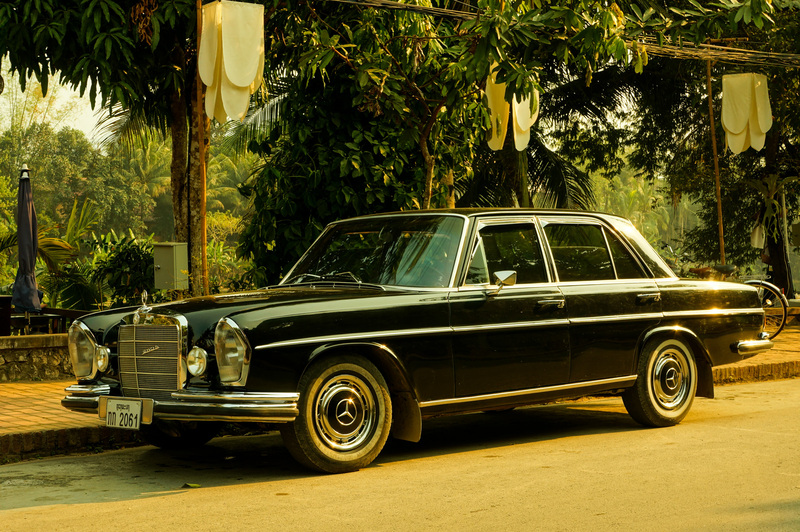 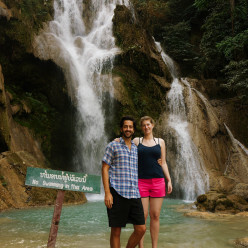 For the final leg of our journey, we traveled from Laos back into northern Thailand. 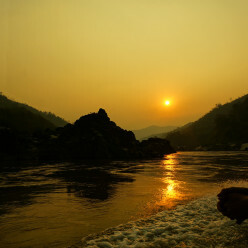 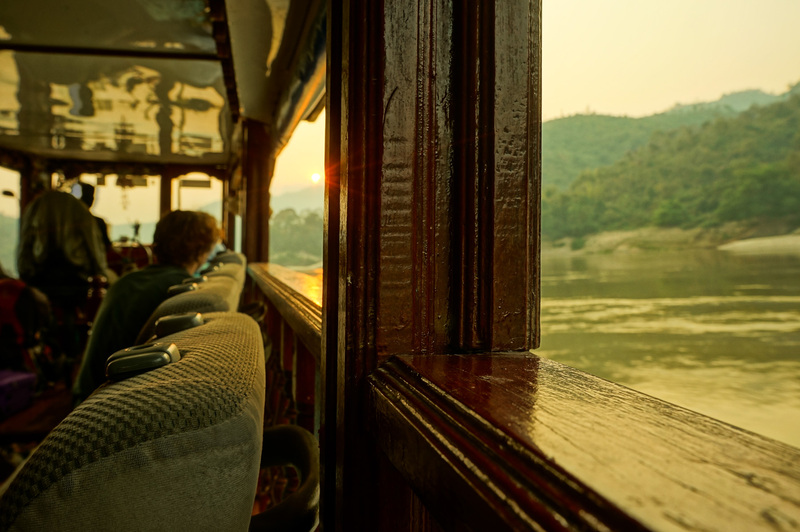 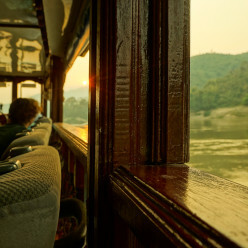 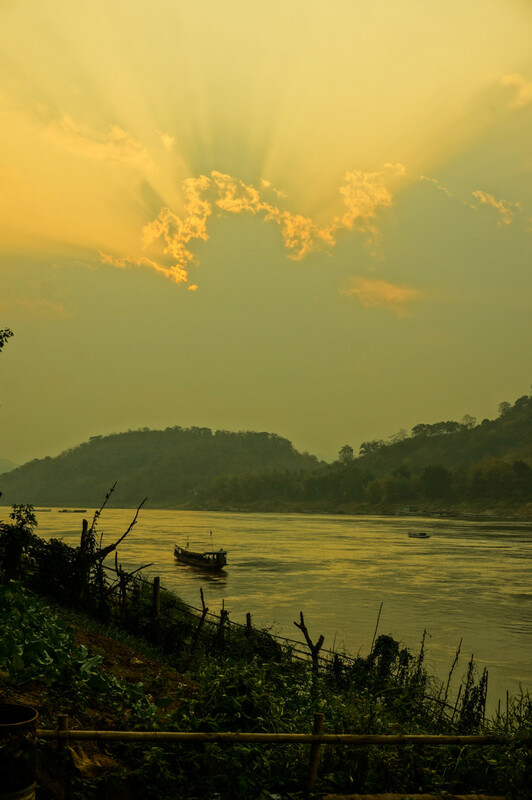 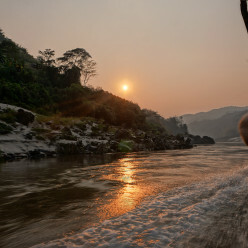 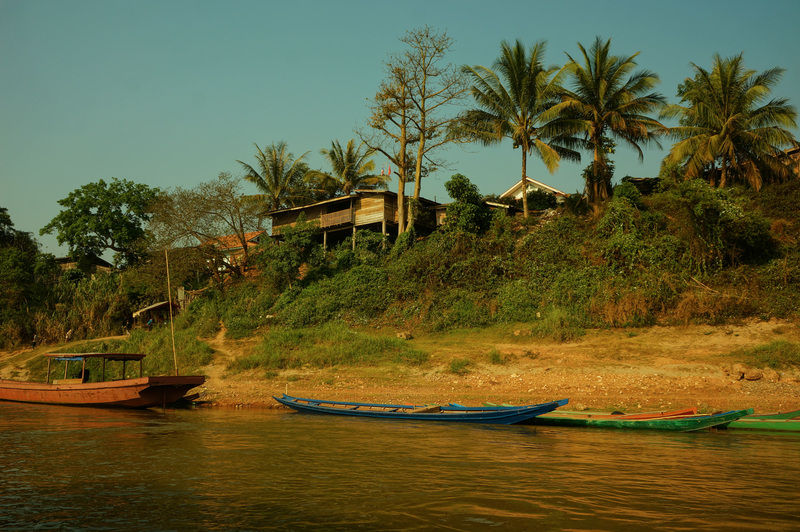 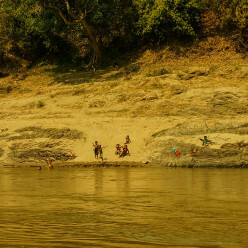 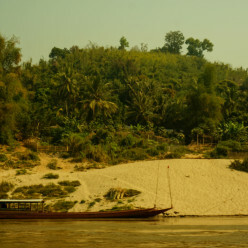 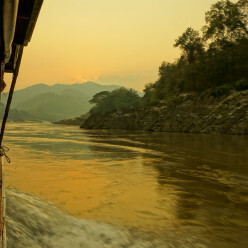 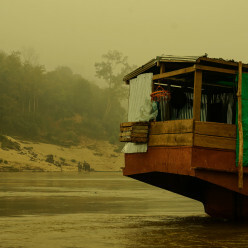 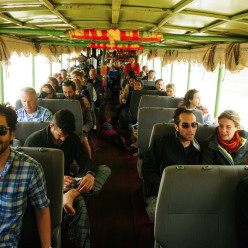 This journey can be made by bus, through the air, or the slowest and most scenic way, by slow boat up the Mekong. 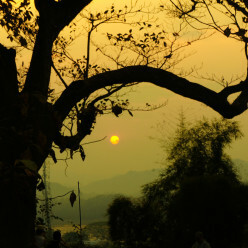 The first day of the boat trip began early at about 7:30am on a small dock at the outskirts of Luang Prabang. After loading up with about 30 passengers and their gear, we were ready for the nine-hour first day to our overnight stop in Pak Beng, Laos. 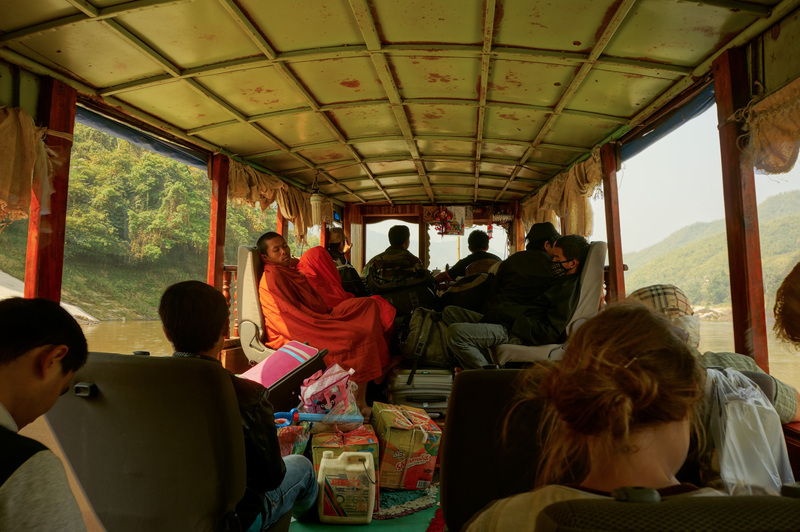 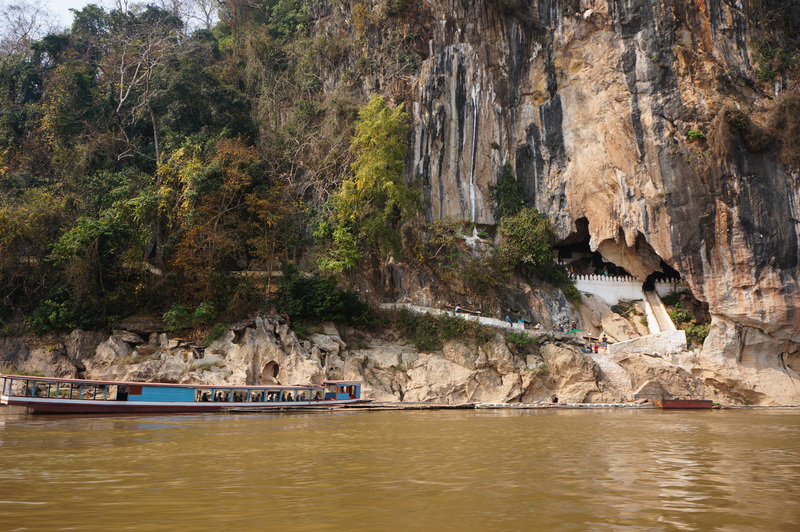 The boat was filled with all different kinds of travelers: tourists, local Lao people, Buddhist monks, and even a few brave families traveling with small children. 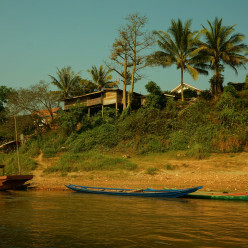 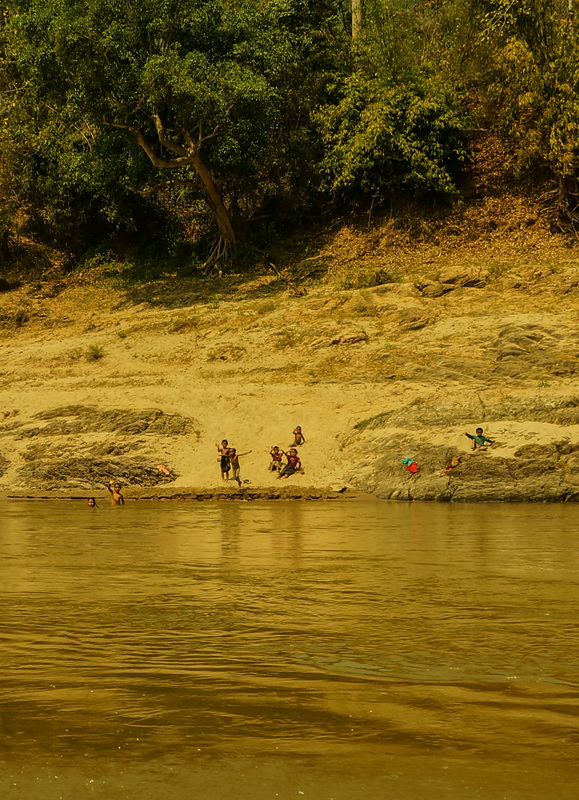 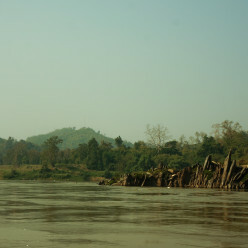 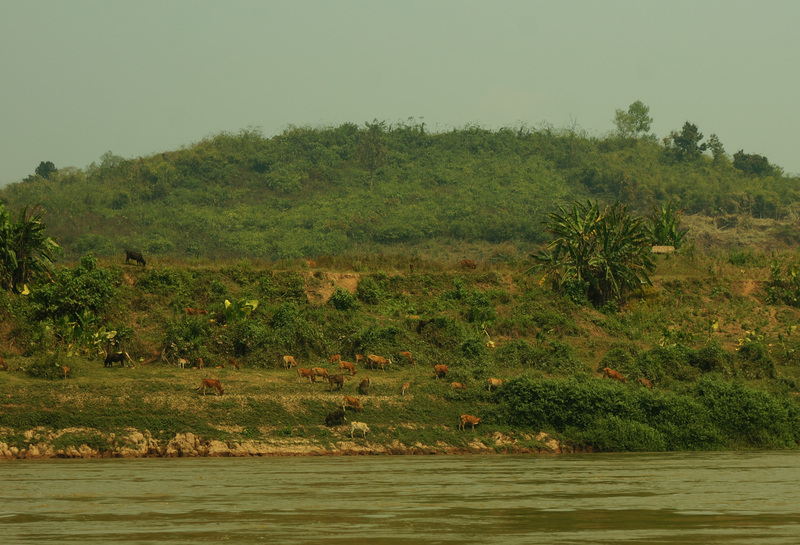 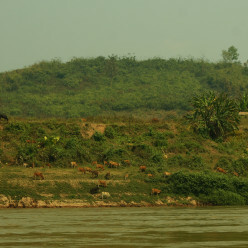 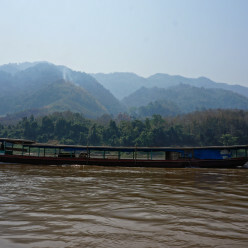 The leisurely cruise up the river was a great chance to see rural Laos. 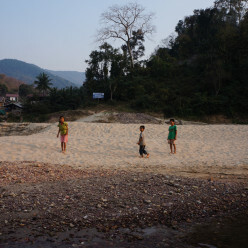 We saw children playing on the sandy beaches, boats hauling in nets of fish, water buffalo grazing and goats climbing on sheer cliffs. 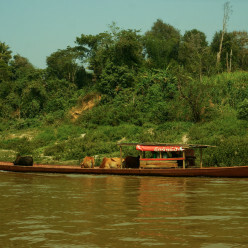 We took the chance to wave at everyone we saw (even the water buffalo), and most of the humans we passed waved back. 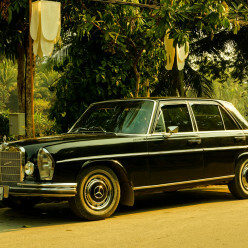 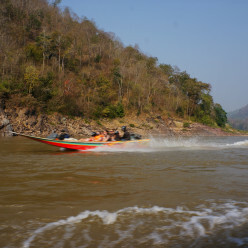 Since we were cruising against the current, the trip from Luang Prabang to the Thai border at Ban Houayxay took two full days. 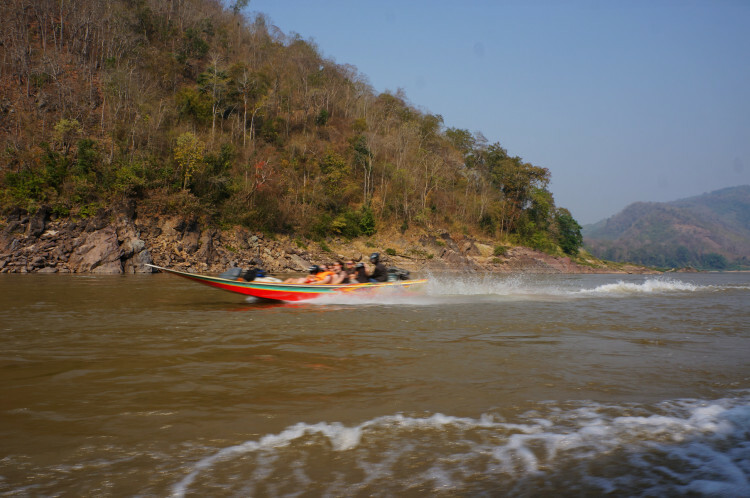 We had the option of taking a smaller and faster vessel that would have cut the trip down to one day, but we’d heard some horror stories about the safety of these speed boats. 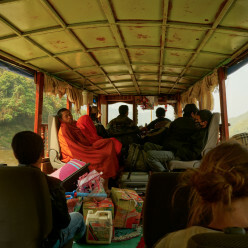 It was also a little bit disconcerting to see the captains of these tiny vessels wearing crash helmets and life vests as they zipped by. 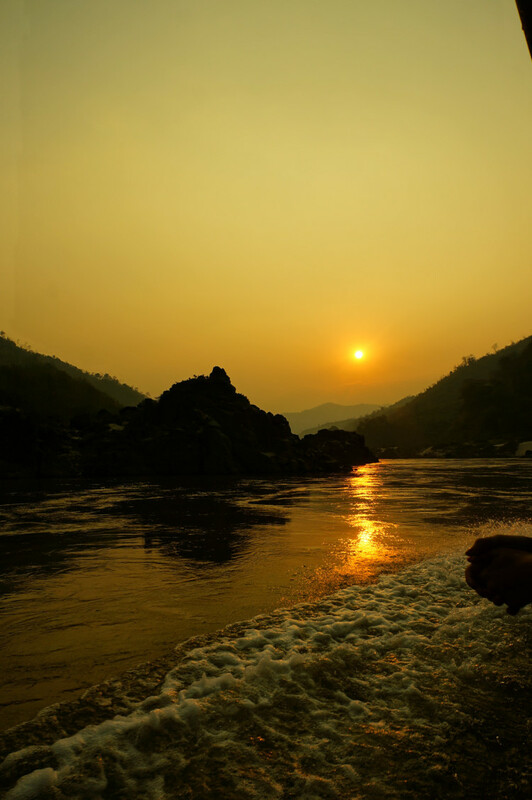 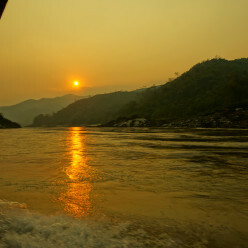 Sunset on the Mekong was one of the major highlights of the journey. 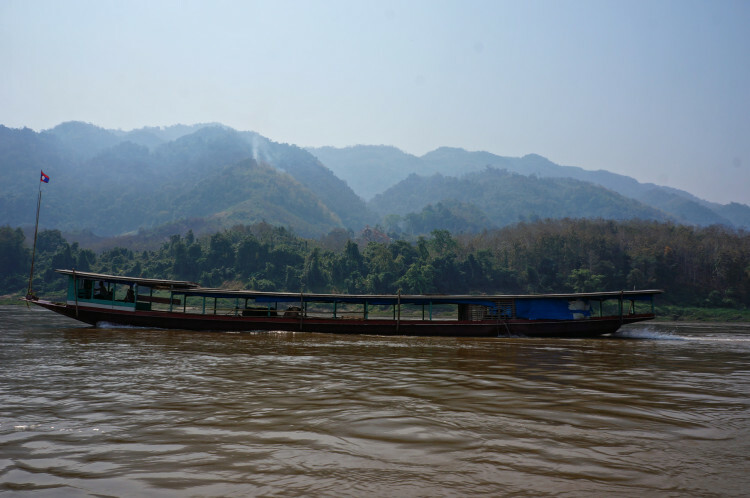 While we brought reading materials, we spent most of our time on the boat staring out at the gorgeous scenery all around us. 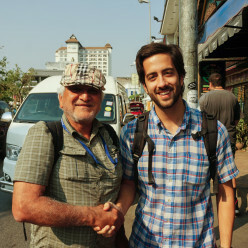 It was also fun to chat with fellow travelers, especially those who spoke French and Italian. 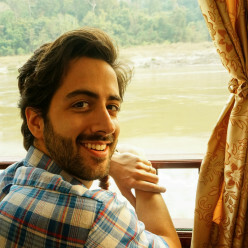 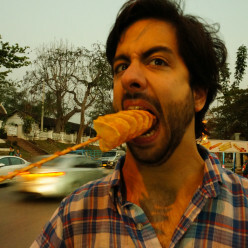 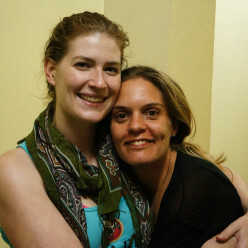 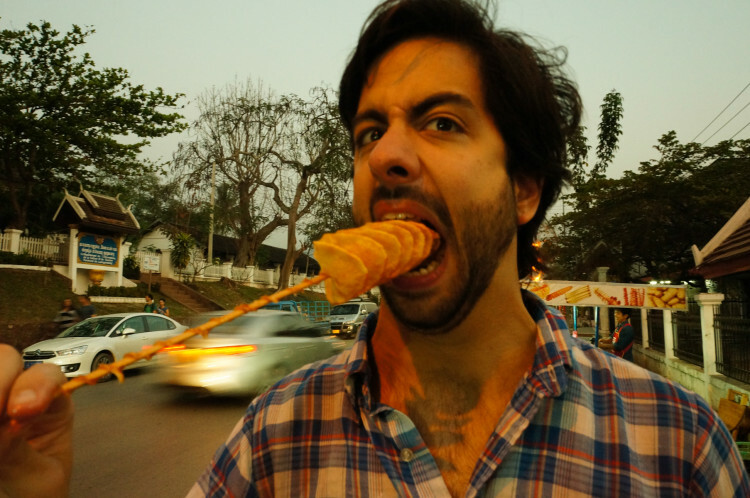 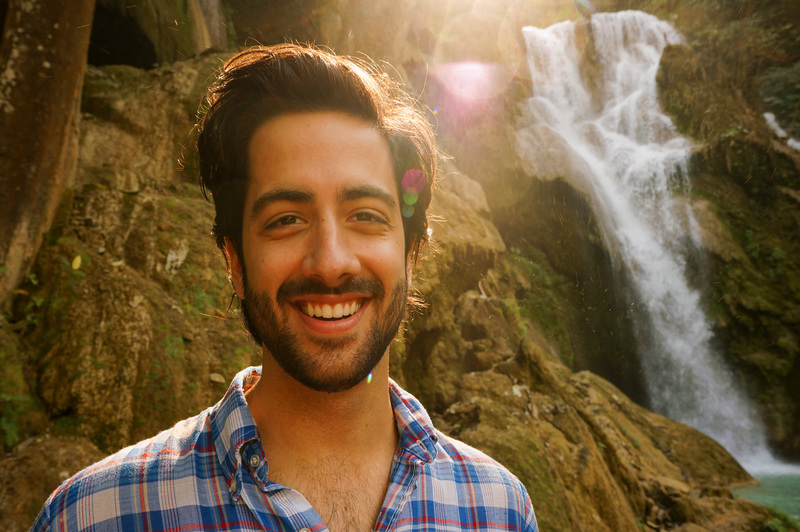 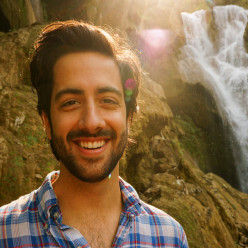 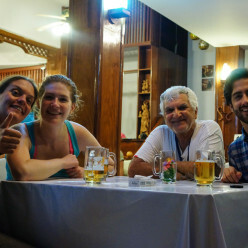 Some of our favorite new friends were a Kuwaiti man named Redha and an Italian woman named Selvaggia. 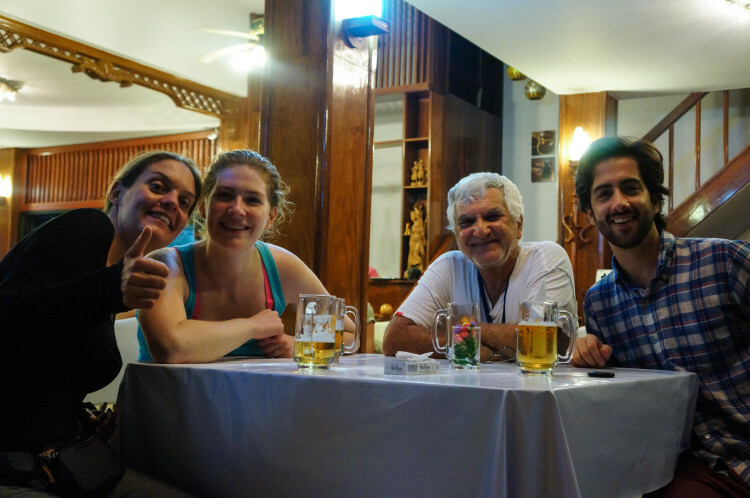 When we stopped for the second night on the Thai boarder, we invited them to join us for dinner, and we all had a great time getting to know one another better over spicy food and cold beer. The last day of our trip back to Thailand was a flurry of activity getting through customs on the Lao side, and arriving on the Thai side of the boarder, followed by a sleepy, four-hour bus ride back to Chiang Mai. 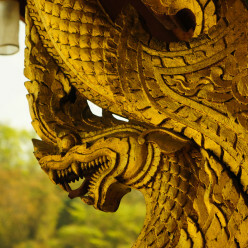 So now we’re back where we started, and looking forward to one last week in Thailand before finally making our way home! 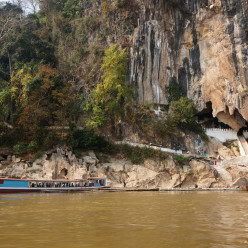 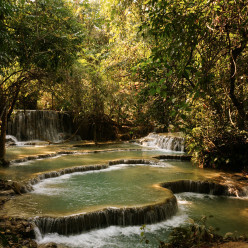 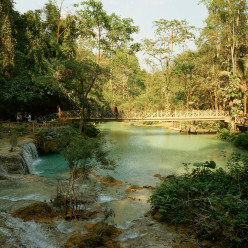 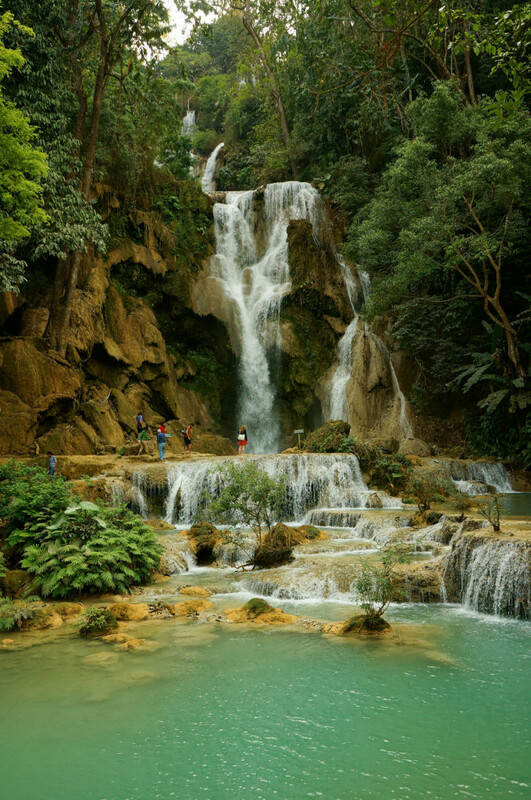 Nestled between Thailand and Vietnam, Laos is a landlocked country with a difficult recent history. 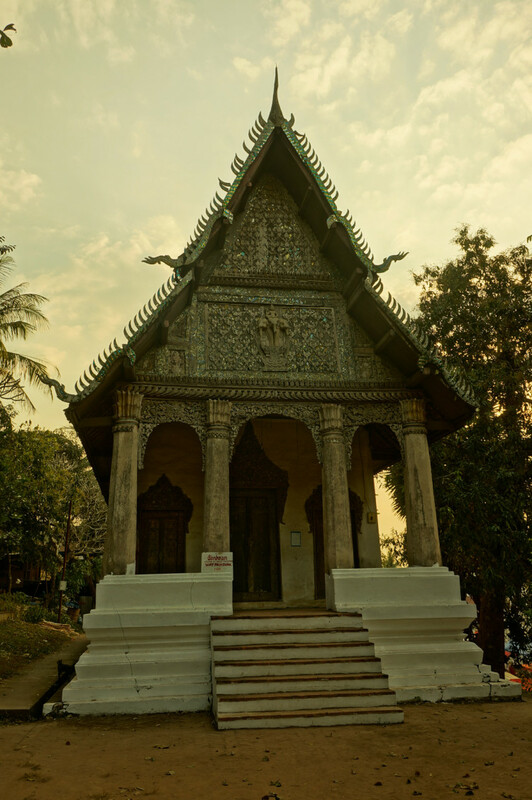 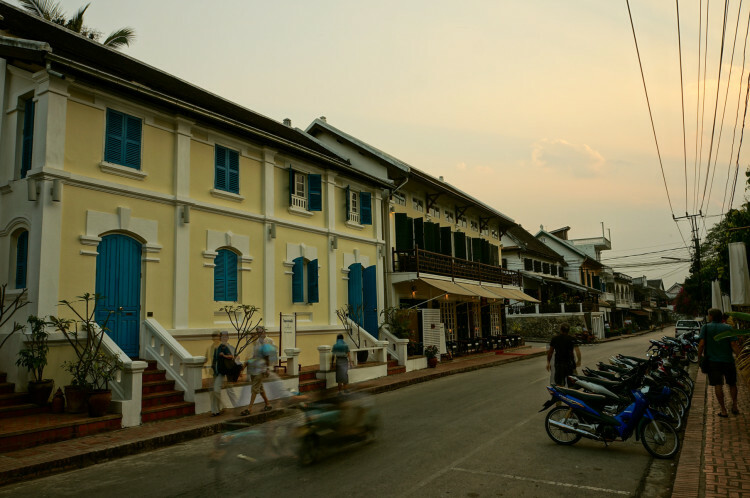 After gaining independence from the French, Laos enjoyed a brief period of monarchy with a modest but beautiful palace in the city of Luang Prabang, where we spent most of our stay in Laos. 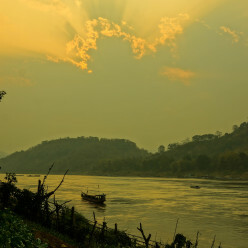 Unfortunately, this period of peace was followed by a long period of strife, as Laos was invaded by Northern Vietnam in the late 1950s, and was heavily bombed by America along the Ho Chi Minh Trail (which functioned as a Northern Vietnamese supply line during the Vietnam war). 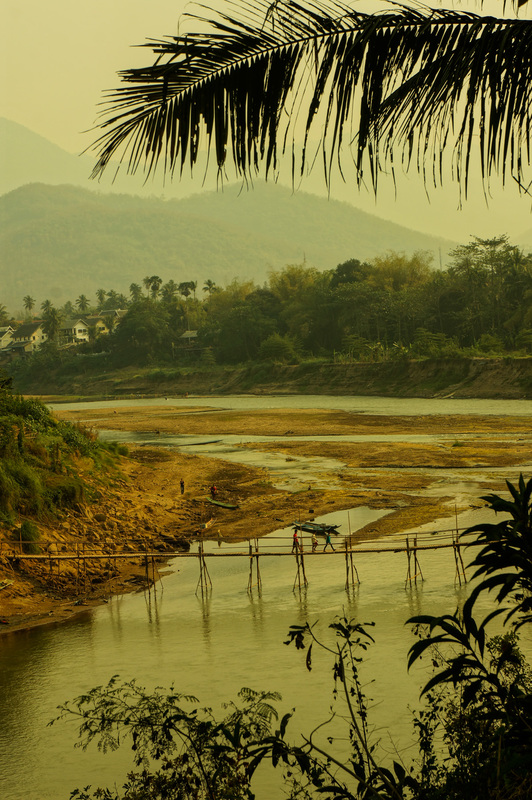 Laos then experienced a long period of civil war and violence as the country completed its transition to socialism. 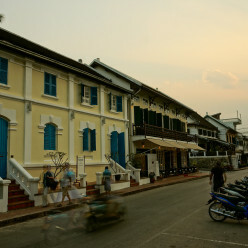 Compared with Eastern Laos, Luang Prabang was left relatively intact. 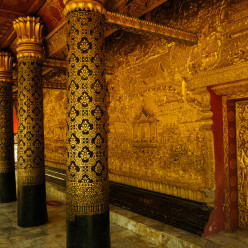 The entire city is considered a UNESCO World Heritage Site, meaning it is of special cultural or physical significance. 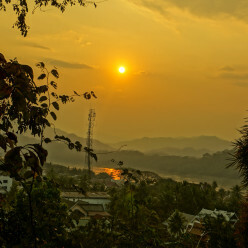 The whole of the old city is filled with beautiful Buddhist temples, restaurants, and resorts, topped off with incredible views of the Mekong river. 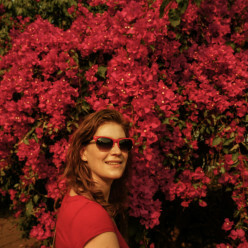 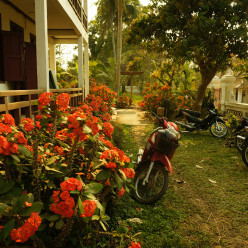 The whole city also smells like flowers, which makes Luang Prabang the most aromatic destination we’ve experienced on our trip. 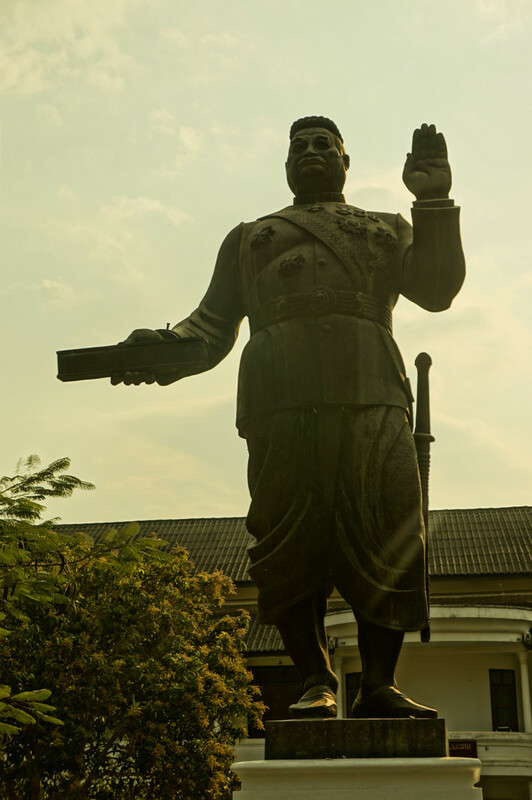 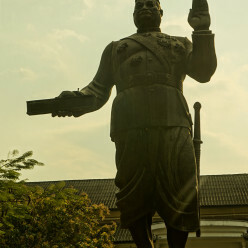 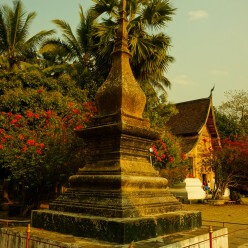 As Laos is now a communist country, the Lao government has no interest in restoring the temples or Buddhist statues that were destroyed during the country’s periods of war and neglect. 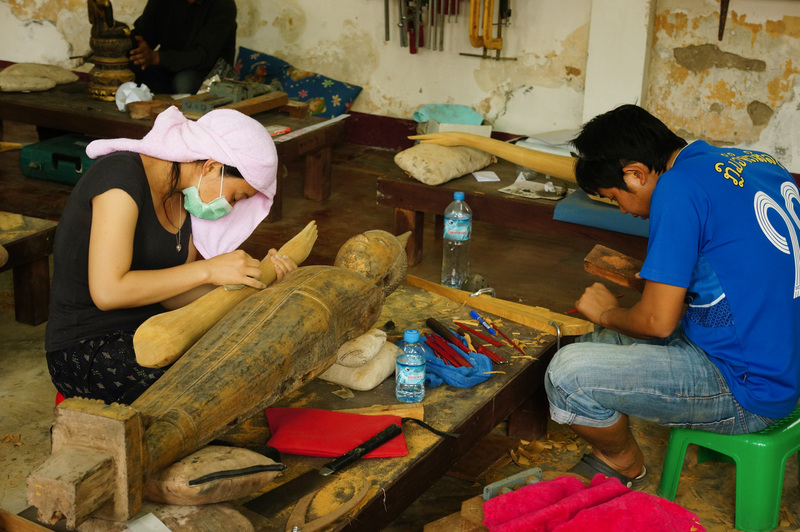 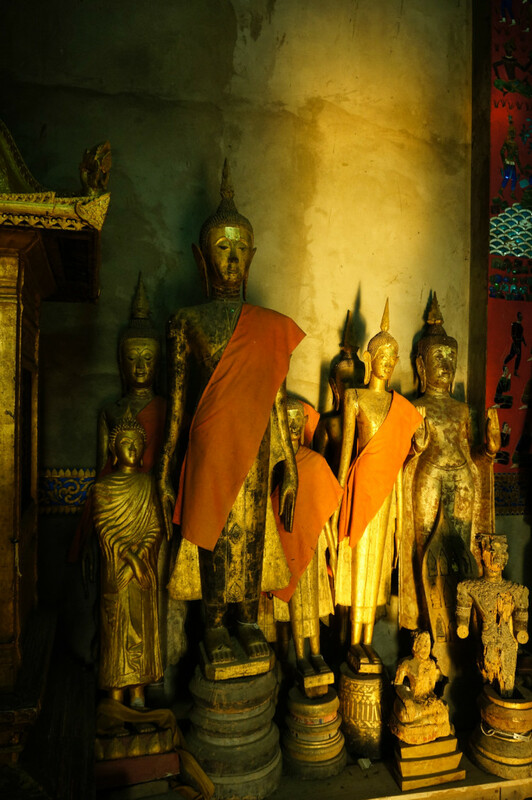 At the Haw Kham Royal Palace Museum, we observed a Japanese group who volunteers one month every year to visit Luang Prabang and teach local university-level art professors how to properly restore damaged Buddhist statues. 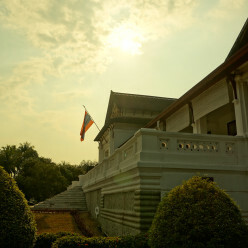 We also had a chance to visit the former Royal Palace (unfortunately, there were no photos allowed inside). 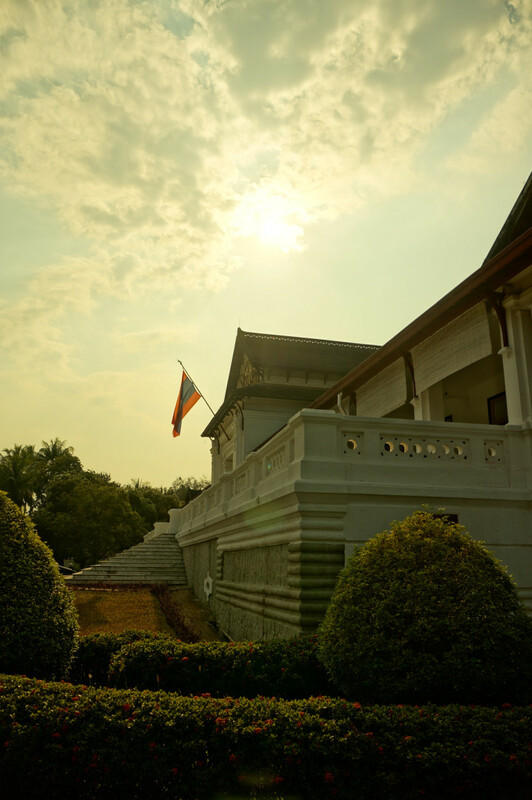 We were somewhat surprised at the modesty of the former royal residence. 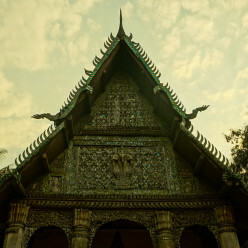 Although there were ornate and intricate mosaics and murals on the walls of many of the reception rooms, the size of the palace itself was quite unassuming. 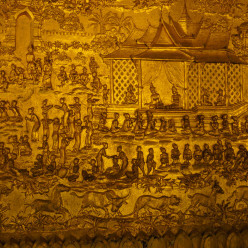 The inner rooms were outfitted with quite simple furniture, and paintings of the few generations of the Lao monarchy. 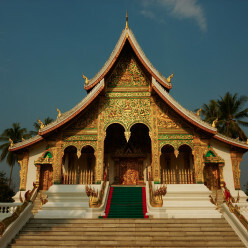 On display were gifts to the Lao government from many different countries, including a presentation of small moon rocks from the United States. 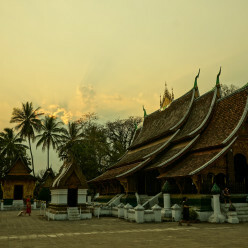 While in Luang Prabang, we had the chance to visit several well-kept Buddhist temples, Wat Souvanna Khiri, and the spectacular Wat Xiang Thong, the most well-known temple in the city. 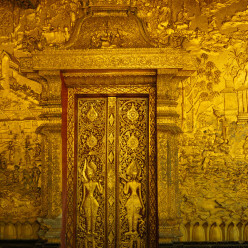 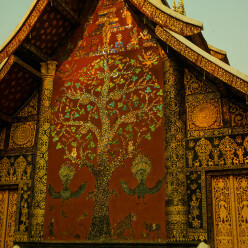 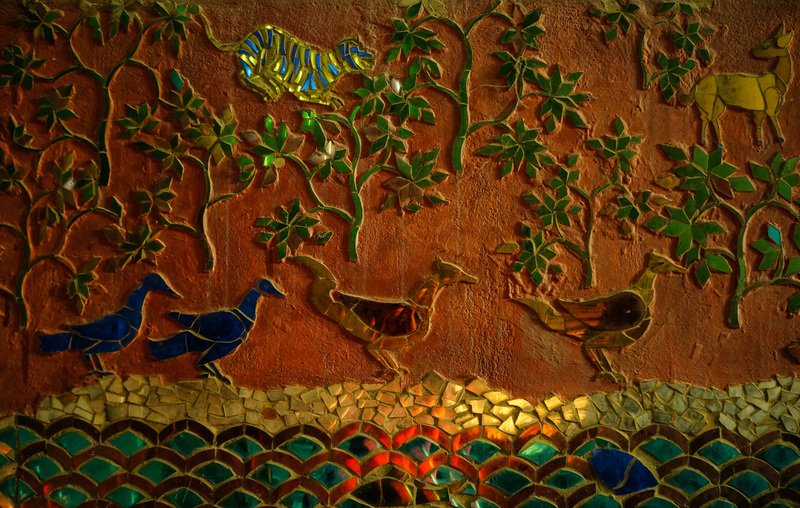 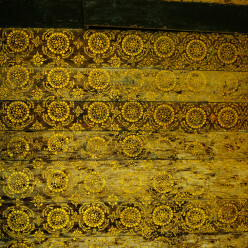 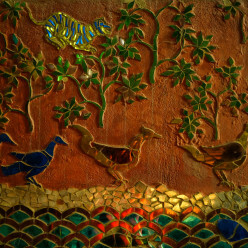 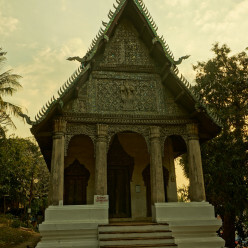 The temples were covered in gold leaf designs applied by hand, gilded relief carvings, and mirrored tile mosaics. 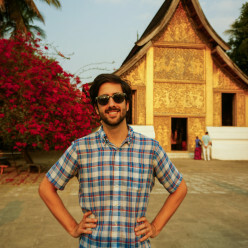 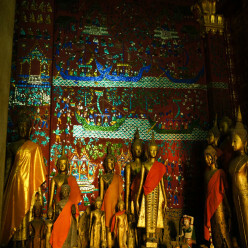 They were truly spectacular to behold, but it gave us pause to think of the disparity between the lavish temples and the third of the country that lives on less than $1.25 per day. 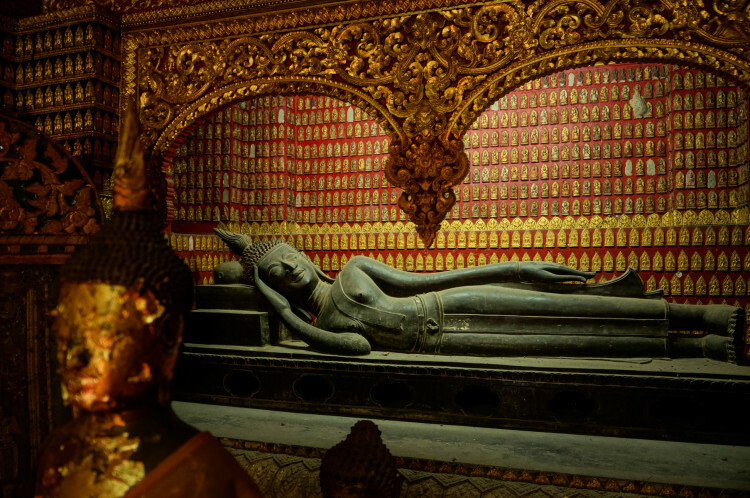 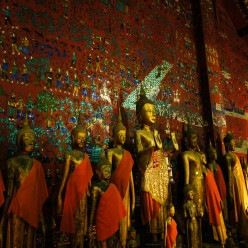 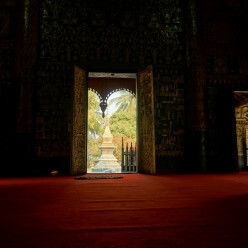 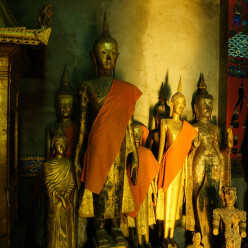 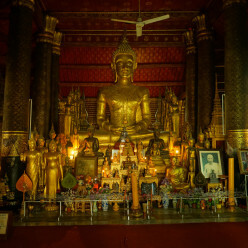 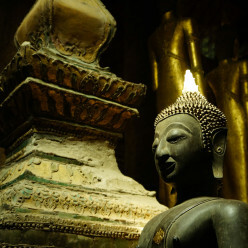 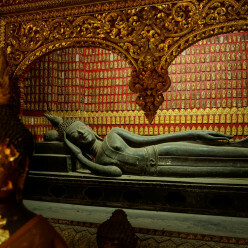 The interiors of the larger temples tend to feature a large image of either a seated or reclining Buddha surrounded by smaller sculptures of Buddha and his followers. 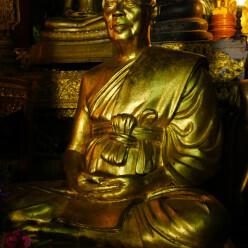 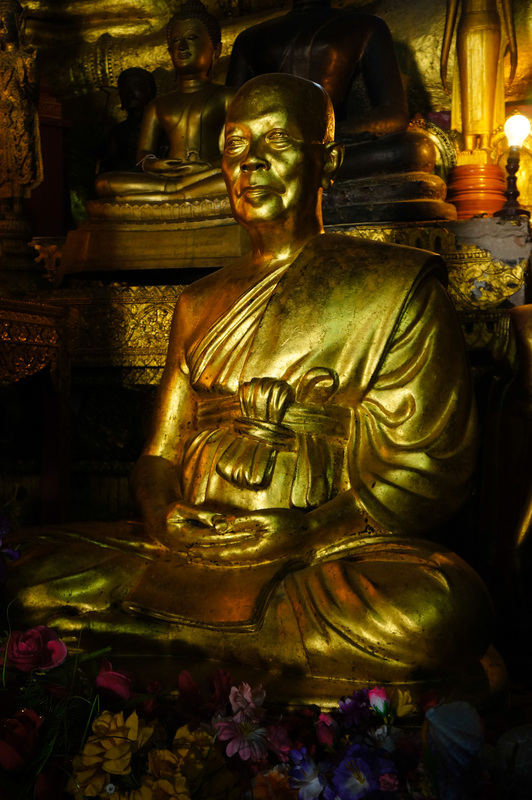 Most of the temples also feature a statue of a particularly revered monk who practiced in that temple or city. 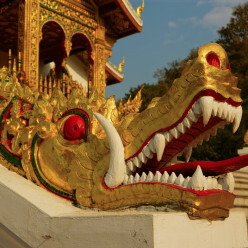 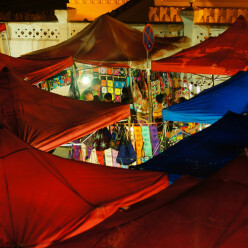 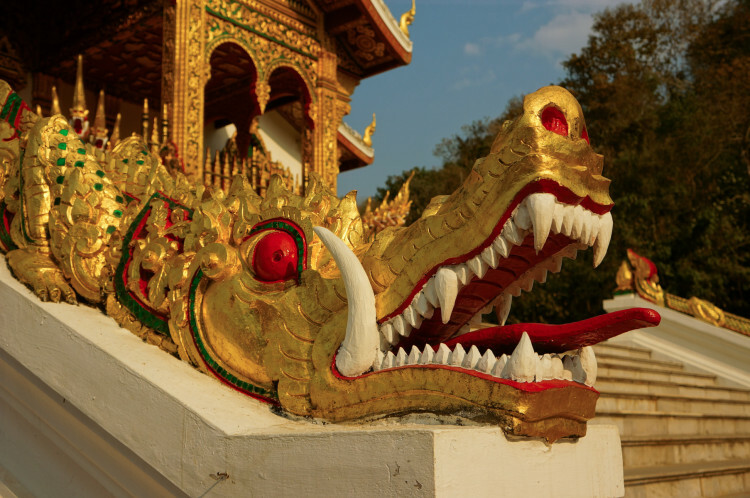 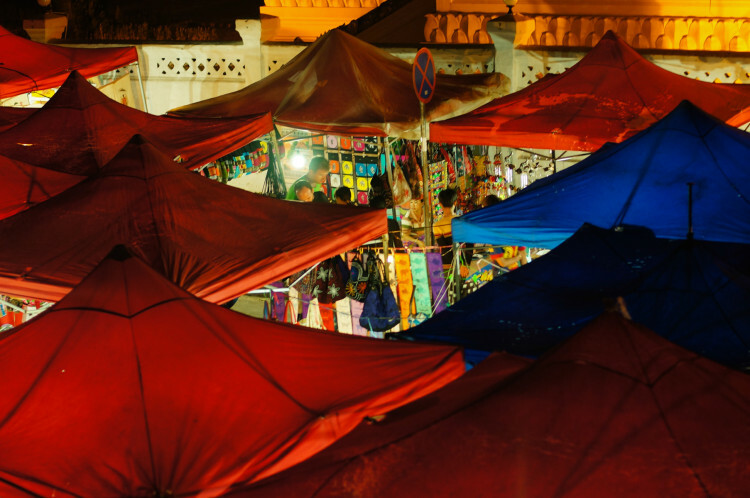 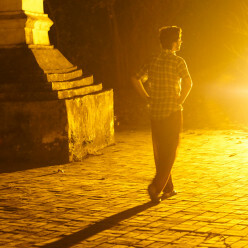 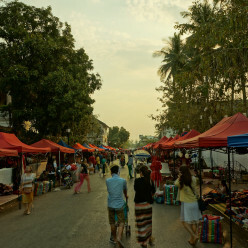 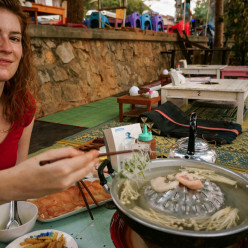 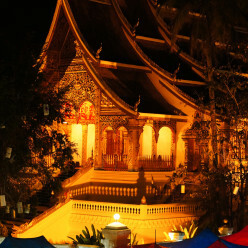 Luang Prabang is home to an enticing night market where primarily tourists can sample Lao cuisine and handicrafts. 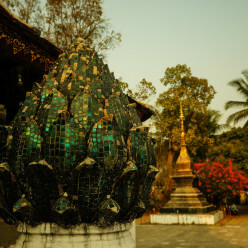 Of particular interest were small aluminum trinkets and jewelry made of recycled bombshells. 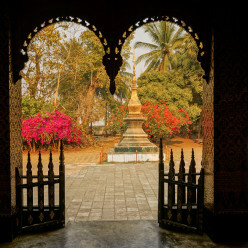 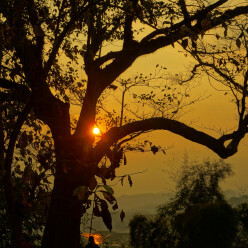 Despite its tumultuous history, the Lao people remain friendly and welcoming to all visitors. 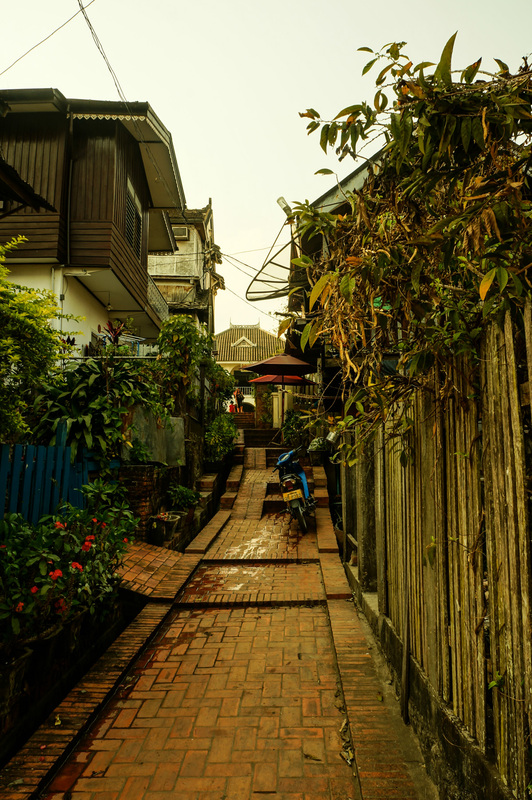 Luang Prabang is a city that’s used to tourists, so it’s hard to gauge the general feeling in other areas of the country. 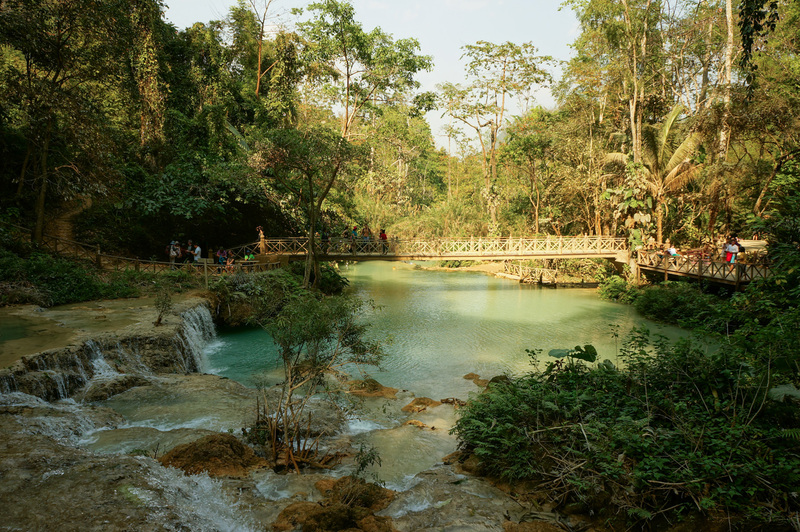 Laos is a country that’s rapidly developing, and still lacks much-needed physical infrastructure like highways and railways, particularly in rural areas. 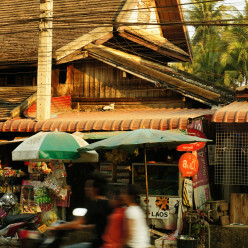 Still, it’s a country that appears to have a lot to offer and look forward to, especially as neighboring Thailand continues to grow. 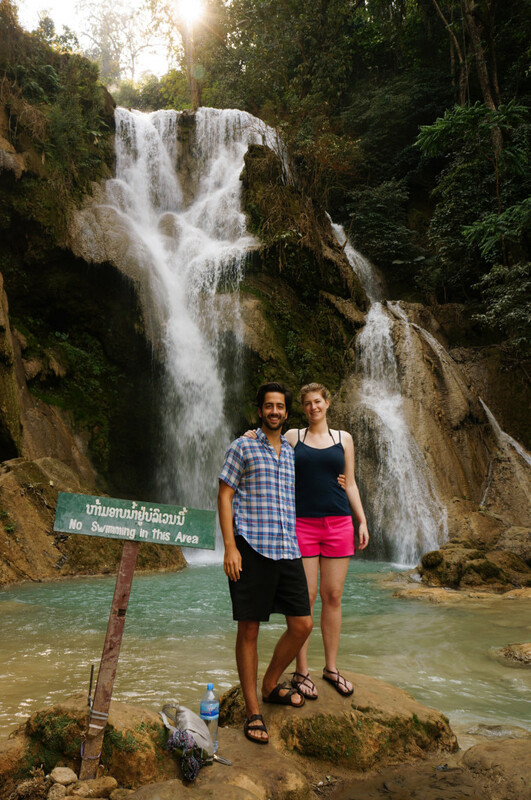 Located roughly 30 kilometers from Luang Prabang, Laos, Kuang Si Falls has been one of the most incredible stops of our journey so far. 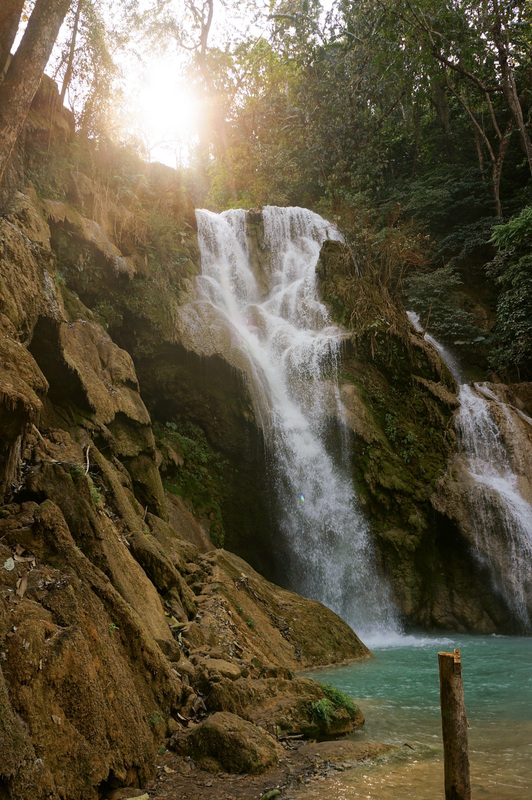 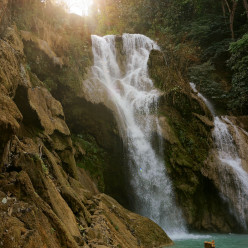 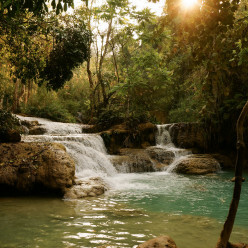 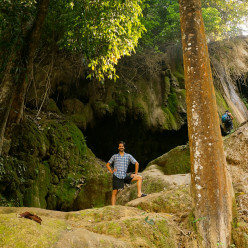 From our hotel in Luang Prabang, a half hour van journey took us to the entrance to the waterfall grounds. 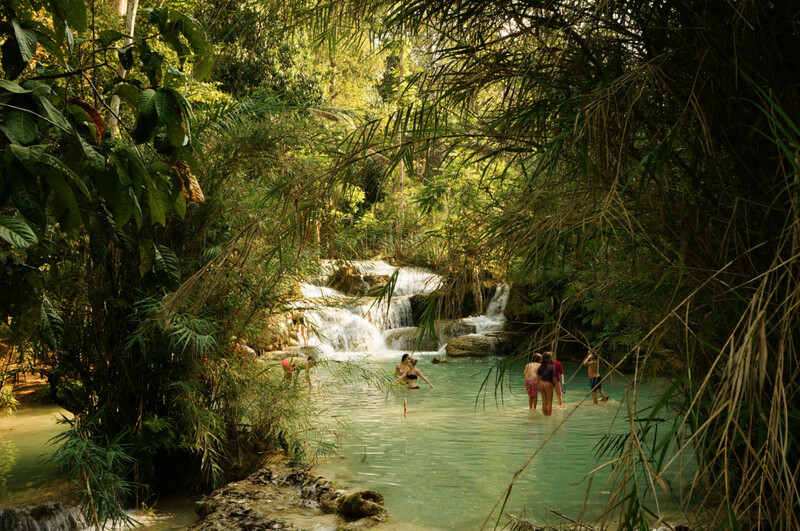 The water at the Falls is incredibly clear, and gathers into pools of bright turquoise. 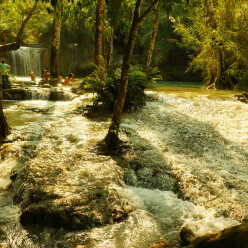 The water, even on a rather hot day, is quite chilly. 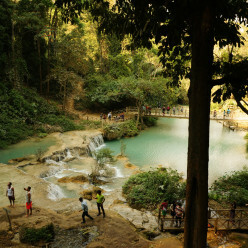 That didn’t stop crowds from swimming in the cascading series of pools, and we got our feet wet as well, although we opted not to jump from the top of a medium-sized fall into the pool below, as some did. 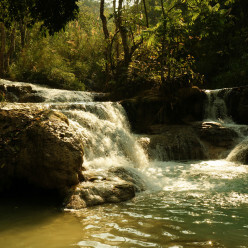 It was very serene to sit on a log in the shallows and watch the water froth down into the pool we were in. 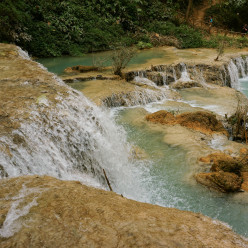 It’s a touristy stop, but an incredibly worthwhile one. 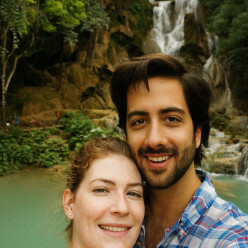 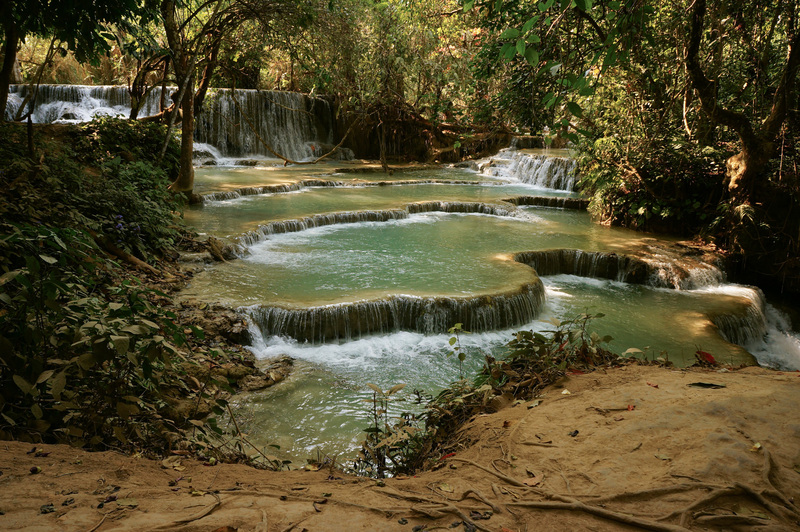 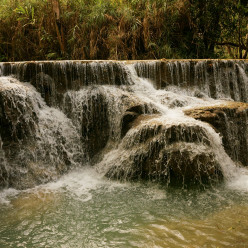 We’ve seen several waterfalls on this trip, and the series of falls and pools at Kuang Si were in a different class. 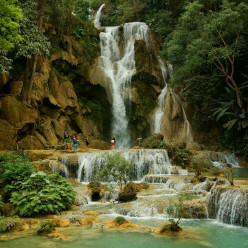 Kuang Si Falls is also a well maintained, clean park. 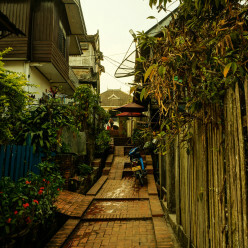 It was refreshing to see trash receptacles (a rarity for anywhere in Southeast Asia), and people using them. 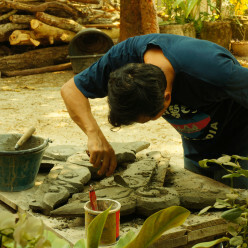 Park workers maintain the grounds nicely, and there are various signs asking visitors not to litter. 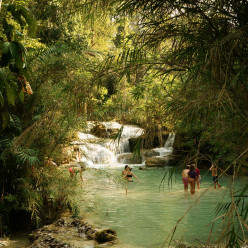 There are also private changing booths for changing into and out of swimming suits, and picnic areas as well. 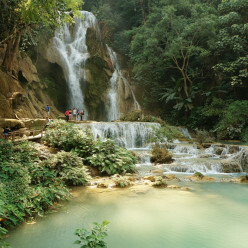 Kuang Si was a great way to spend a hot afternoon in Laos, and although we came prepared with plenty of SPF, the Falls are actually quite shady. 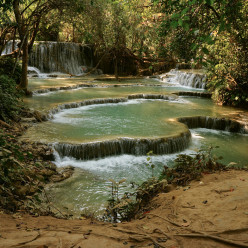 The Falls are surrounded by a forest and the path alongside the pools is lined with trees as well. 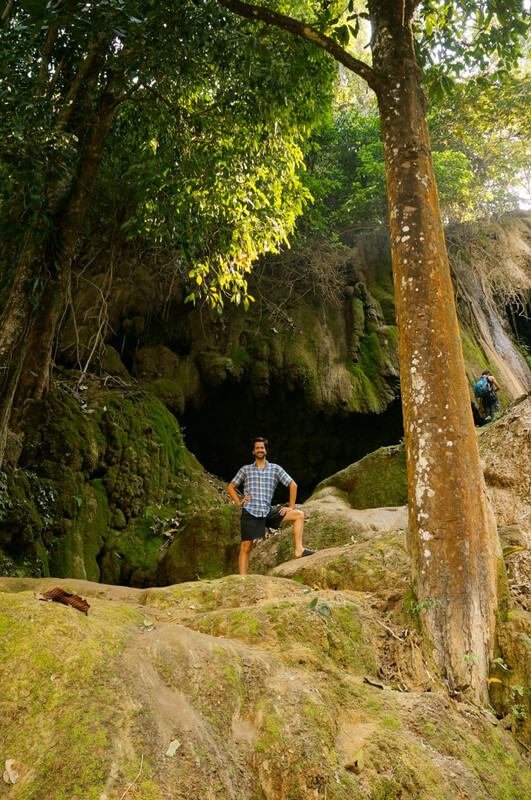 There is even a small mossy cave that we took the chance to explore. 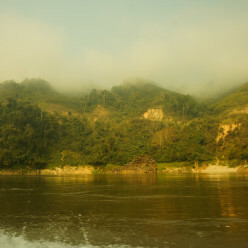 As we headed back to the van, we passed the sun bear sanctuary near the exit. Unfortunately, the bears seemed to be in for the evening, but we were glad to see their enclosure was quite large and full of bear amusements. 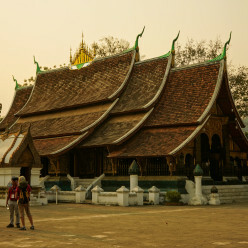 As we left the park, we stopped at a stand selling delicious iced Lao coffee and bought one for the ride back.